Ashok Machine Tools & Other Associates concerns Viz. He has a natural APT for engineering and technical subjects. Practical training and in depth knowledge has made him develop patents and copyright designs. With no formal training in this sector still with immense zeal & dedication for work has earned him respectable place in Technical Committee of Bureau of Indian Standards. He has developed many special purpose machine to suit the requirement in an efficient manner. He has a battalion of engineers working under him and is considered to be an authority in sheet metal line. He was one of the pioneer to develop hand operated tin manufacturing plants and also made further innovation in the stove industry. 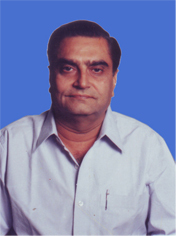 He developed first time in India pressure stove which has been awarded The Quality Mark (ISI). On behalf of the entire "Ashok Group" he received The Award of Excellence from the Union Finance Minister Now Hon. Prime Minister Dr. Manmohansigh for the Best SSI Unit.